TACKLING – AND SOLVING – ARSON CASES FOR THE PHOENIX FIRE DEPARTMENT, IT’S SAFE TO SAY THIS GUY’S A TRUE TRAILBLAZER. The Phoenix Fire Department didn’t know what to expect a year ago when it gambled on a retired city cop to save its arson unit. Folks there only knew two crucial things as they hired Jack Ballentine to head the Fire Investigations Division: They knew they desperately needed help – their dismal record of catching arsonists was something they didn’t want the public to know. And they knew it was a crapshoot to resolve the longstanding angst between the city’s fire and police departments by hiring a former cop. In his first six months on the job, Ballentine’s expert training in investigative techniques took the unit from having one of the worst records in the country of solving arson to one far above the national average. In his first nine months, he helped investigators solve the most important case on the fire department’s books: the 2001 Southwest Market fire that killed beloved Phoenix firefighter Bret Tarver. And most surprising of all, in the past year, Ballentine has made major strides in mending the rift between the Phoenix police and fire departments, starting a new era of joint support and cooperation. “We’re thrilled,” says Fire Chief Bob Khan, who made beefing up the arson unit a major priority of his new administration. “We’ve improved tremendously,” says Deputy Chief Mike Berggren, who begged for years to bring the arson unit up to snuff and is retiring this year knowing he finally made it happen. As for Ballentine, he simply wants the focus and glory to rest on the 15 men and women in the unit who he says always have had the heart and soul to solve arson crimes. Jack Ballentine is a tall, strong guy who resembles an overgrown boy. His kind face only gets kinder when he smiles, and he’s been smiling – beaming, actually – a lot lately. He was ending an illustrious 30-year career with the Phoenix Police Department last summer when fire officials approached him about a new position at the fire department. After all he had gone through as a cop, nobody would have blamed him if he decided to dismiss the offer and simply enjoy his hard-earned retirement instead. When he looks back on his career, Ballentine lists his No. 1 case as solving the murder of Phoenix police officer David Uribe, who was shot while making a routine traffic stop on May 10, 2005. Ballentine’s investigation fingered two methamphetamine abusers who were “out to kill a cop,” he says. The alleged shooter is still facing trial while his accomplice has been convicted of second-degree murder and is in prison. Ballentine’s last perfect year as a cop also happened to be the year Phoenix New Times reporter Paul Rubin was shadowing him for an in-depth profile. In fact, it was Rubin who first brought Ballentine’s name up for the new arson job. 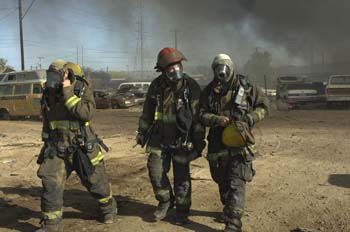 For years, Rubin and Phoenix Fire Chief Bob Khan have walked together for exercise – the central fire administration complex and the New Times building are a block apart – and it was on one of those walks that Khan mentioned he wanted the fire department to get serious about solving arson. Rubin, who was in the midst of his detailed profile of Ballentine, suggested he’d be a good candidate for the job. Many others saw the same potential in the job, and the department had more than 70 applicants from across the country, including fire chiefs, attorneys, cops and others. But when they whittled down their list of applicants, it was the hometown boy who came out on top. In July 2007, Ballentine moved into his office in fire headquarters and instantly went to work. The first thing he did was enroll his investigators in the 18-week detective course at Rio Salado College he created a decade ago. The “Criminal Investigations” course, which he also teaches, is so detailed and time-consuming that it’s closed to everyone but law enforcement and demands five-and-a-half hours of classroom time each week. Lessons cover report writing, interviewing, search warrants, evidence collection, investigative follow-up and crime scene investigation. “Without these tools, how do you do a successful investigation?” Ballentine asks, noting that, until now, arson investigators were basically operating with nothing but common sense and dumb luck to guide them. Until Ballentine came along, they really only had one tool to help them prove a fire had been purposely set. State Farm Insurance has long provided a specially trained dog to the department who can sniff out certain substances like gasoline. The current dog is a chocolate Lab named Sadie. “If gas is used to set a fire, Sadie’s going to find it,” Ballentine brags. But determining a fire was caused by arson and finding the arsonist are two different things, and it was this second part the department needed major help with. Ballentine decided to get everyone in the arson unit involved in the investigation process. Case in point: Fire Department administrative assistant Karen Warrington had taught herself to access police records (rap sheets, license plates, addresses) to track down clues. As one investigator notes, “If we needed to run something, we’d take it to Karen and she’d find it.” Ballentine saw Warrington as “such a natural” that he enrolled her in several training programs to get her certified as an arson analyst. Of the 1,000 structure fires in Phoenix in any given year, about 300 are suspected of arson – with an amazing 60 percent of them thought to be set by juveniles, Ballentine says. “If we suspect arson, the criminal investigation begins, and now they’re just like homicide or burglary investigators,” Ballentine says. He knew all of that when he walked through the door last summer. He also knew Phoenix fire investigators had a record of clearing only 8 percent of their cases – one of the lowest rates in the nation. But by January of this year, his new training and tactics had brought that clearance rate to 29 percent – way above the national average of 18 percent. Just days before Jack Ballentine started his new job, three teens were arrested for setting fires at Cholla Middle School in Phoenix, causing thousands of dollars in damage. An alert security guard caught the boys and detained them until police arrived and arrested them. By then, arson investigators had already had weeks of classroom training in Ballentine’s investigative course and were aggressively putting to work the information they were learning. In the end, Captain Hernandez’s investigation nailed one of the arsonists and kept an innocent teen from being charged with a crime, Ballentine noted in commending him. And you can see why if you ever catch the arson investigators at work at the Phoenix Police Academy in south Phoenix. “Honor. Pride. Integrity.” Those three words are inscribed on the front gate of the academy, which is nestled within South Mountain Park. They’re also etched into the administration building of this modern, well-equipped training center – the first stop for anyone interested in law enforcement work in Phoenix, including arson investigation. If you can’t make it through the academy (expect to lose a few pounds and gain some muscle as you endure rigorous training), you can’t be a cop. The academy also offers special training to firefighters to become certified peace officers, and now Ballentine has added an entirely new routine. It’s a Tuesday morning in February and a half-dozen fire investigators are sitting around computers learning how to track down suspects. Beefy police instructors, who obviously had no trouble maneuvering the trials of this academy themselves, are showing students how to access ARs (arrest records) and DRs (department reports) and how to trace license plates, often the only clue investigators have to track down someone from the scene of a suspected arson fire. After the computer classes, the group walks up a hill to the Tactical Village built eight years ago to give officers a hands-on experience of dealing with suspects. The village is a replica of about every type of structure they’re bound to encounter: a two-story apartment complex, a single-family home, a convenience store, an alley. While it’s basic police training to learn how to approach a suspected criminal, this is all new to firefighters, even those who investigate arsons. These are men and women trained first and foremost to run into a burning building; they’re used to being the “good guys” who come to save you (as opposed to the “bad guy” cops who come to arrest you), and confronting suspects hasn’t been a typical part of their job description – until now. The investigators are suited up for protection – thick chest and groin pads, helmets, steel-toed shoes. They’re all equipped with simulated Glock handguns loaded with soap bullets that won’t kill you through your padded vest but will still hurt like hell. Today they’re going after a guy in the single-family house, and as three investigators take up positions, they knock on the door. “The most dangerous moment is when you knock and they open the door,” they’re told. In the midst of this simulated lesson, beepers start going off for real, signaling a fire somewhere in Phoenix. The investigator who’s on tap to respond is here training, so Ballentine gets on the phone to send someone else. But the minute they’re done with the training, some of the investigators race to the fire scene. Someone has tried to blow up a home but has destroyed it with a fire instead. The investigators discover they are about to use in real life the very computer techniques and home arrest tactics they learned that afternoon at the academy. By 10 p.m. that night, they have traced the car spotted at the scene, gone to the owner’s home, confronted him, discovered incriminating evidence and arrested him for suspected arson. Not quite. It was just days from getting a whole lot better – days from the moment this entire department had yearned for more than seven long years. Ever since the day Bret Tarver died. The Phoenix Fire Department, which was led for decades by former Chief Alan Brunacini, is a pretty safe place to work, considering how lethal the work can be. In the past 34 years, they’ve lost four men to vicious flames. When they lost Bret Tarver on March 14, 2001, there hadn’t been a fire death in the department in 16 years. While every death of a first-responder brings a special kind of grief – these are men and women putting their lives on the line to serve the public – Tarver’s death hit particularly hard, and how he died affected everyone so deeply that it forever changed the way this fire department approaches fires. Forty-year-old Tarver was trapped by debris during a swift-moving blaze at the old Southwest Market at 35th Avenue and McDowell Road. As rescuers tried to reach him, he ran out of oxygen. He was a big, strapping, handsome man with a beautiful wife and three little girls and was one of the department’s favorites. Anyone living in Phoenix at the time remembers the memorials made of flowers and teddy bears and best wishes that carpeted the driveway of his fire station. The entire city mourned this horrible loss. It was a moment that seared Brunacini’s soul, and in response, he revamped the firefighters’ training and brought in new technology. All the while, everyone in the department knew the awful truth: This wasn’t an accidental fire. This was arson. The department put up fliers around the market’s neighborhood after the fire, hoping someone would come forward with information, but no one ever did. And then, last August, as Ballentine reviewed the “cold cases” of arson, he suggested they get aggressive about finding whoever set the fire that killed Tarver. Go to the media – English and Spanish – and say we’re looking for information on this fire, he suggested to Captain Willie Nelson, who took on the case. Put up some more posters and let’s see what happens, he said. What happened was this: The posters kept disappearing. “We knew we were in the right neighborhood,” Nelson says. And then came the anonymous tip. A person who didn’t identify himself and left no contact number called to name the person who set the fire and gave a motive. The guy told Nelson that the day of the fire, 17-year-old Christopher Benitez had called him and made jokes about the fire. “The guy told him, ‘Don’t be saying that stuff – somebody died there and it’s nothing to joke about; it will come back to haunt you,’” Nelson remembers. He now had three tips that all pointed to the same person. He researched Benitez’s background and found he’d been arrested in the past for possession of marijuana and assault and was still living at home in Phoenix, in the very neighborhood where the fliers had been disappearing. In February, Benitez joined the Army and was stationed at Fort Hood, Texas. Nelson and Ballentine flew to Fort Hood to confront Benitez, who was now 24 years old. They interviewed him in March, just shy of the anniversary of Tarver’s death. Initially, Benitez said he and his cousin, Michael Torrez, watched the fire from the sun deck of Benitez’s nearby house. Later, he changed his story and said they were at his cousin’s house, watching from afar and that when they first saw the fire it was already a huge blaze. As Nelson carefully took him through the story again and again, he found Benitez could remember the shirt he was wearing that day – the kind of information you’d only remember if that day was extra special in your life. Benitez kept changing the story and eventually put himself at the fire. He didn’t admit setting it but said he was there when it started, as though he and his cousin were bystanders. Nelson told Torrez that Benitez already had admitted they were at the site of the fire, and Nelson remembers the inmate looked a little sick and said, “He threw me under the bus.” Now, believing his cousin was trying to make him the patsy, Torrez said they went to the market and saw the fire was merely smoldering – unlike the “blaze” Benitez remembered. Torrez also knew something else important about that fire – he knew Bret Tarver’s name. “Most people would remember the incident and that somebody died but not the specific name,” Nelson says. Benitez was a 17-year-old “punk” who was “not in a good place” in 2001 and went to an even darker place when he was caught shoplifting two 12-packs of beer from Southwest Market. The manager caught him and pulled him back into the store (although at Fort Hood, Benitez tried to say the manager was “very, very nice; polite and kind,” which Nelson knew was the opposite of what had really happened). Benitez didn’t like the way the manager treated him, so he came back the next day to set a fire in the trash behind the store to cause him grief. The fire took off, ending in tragedy. Nelson was completing his investigation at press time and was submitting a full report to the county attorney’s office, where they hope the information is solid enough to charge the suspects with arson and murder. And without Jack, there wouldn’t be the new cooperation between the fire and police departments, Nelson adds. Jack Ballentine is sitting behind his neat desk, listening to his boss brag about how much he’s done for the fire department in the short year he’s held the job. He’s paying particular attention to the new sense of cooperation coming out of the city’s first-responders. And he’s got that wide smile on his face, like he knows what a great job he’s done but is pleased as punch to hear others spread the news. Actually, the guy is beaming.